About the Book: In October 1863, the Union Army of the Cumberland was besieged in Chattanooga, all but surrounded by familiar opponents: The Confederate Army of Tennessee. The Federals were surviving by the narrowest of margins, thanks only to a trickle of supplies painstakingly hauled over the sketchiest of mountain roads. Soon even those quarter-rations would not suffice. Disaster was in the offing. Yet those Confederates, once jubilant at having routed the Federals at Chickamauga and driven them back into the apparent trap of Chattanooga’s trenches, found their own circumstances increasingly difficult to bear. In the immediate aftermath of their victory, the South rejoiced; the Confederacy’s own disasters of the previous summer?Vicksburg and Gettysburg?were seemingly reversed. Then came stalemate in front of those same trenches. The Confederates held the high ground, Lookout Mountain and Missionary Ridge, but they could not completely seal off Chattanooga from the north. The Union responded. Reinforcements were on the way. A new man arrived to take command: Ulysses S. Grant. Confederate General Braxton Bragg, unwilling to launch a frontal attack on Chattanooga’s defenses, sought victory elsewhere, diverting troops to East Tennessee. 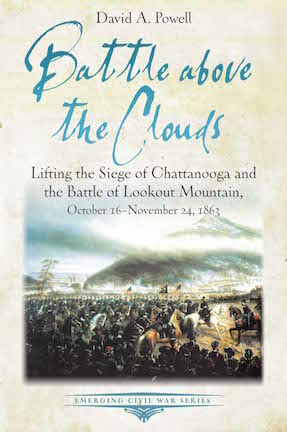 Battle above the Clouds by David A. Powell recounts the first half of the campaign to lift the siege of Chattanooga, including the opening of the “cracker line,” the unusual night battle of Wauhatchie, and one of the most dramatic battles of the entire war: Lookout Mountain. About the Author: David A. Powell is a graduate of the Virginia Military Institute (1983) with a BA in history. He has published numerous articles in various magazines, and more than fifteen historical simulations of different battles. For the past decade, David’s focus has been on the epic battle of Chickamauga, and he is nationally recognized for his tours of that important battlefield. The results of that study are the volumes The Maps of Chickamauga (2009) and Failure in the Saddle (2010), as well as The Chickamauga Campaign trilogy. The Chickamauga Campaign: A Mad Irregular Battle was published in 2014, The Chickamauga Campaign: Glory or the Grave appeared in September 2015, and the final volume, Barren Victory, was released in September 2016. David and his wife Anne live and work in the northwest suburbs of Chicago, Illinois. He is Vice President of Airsped, Inc., a specialized delivery firm.